The most important parameters are base_estimator, n_estimators, and learning_rate. base_estimator is the learning algorithm to use to train the weak models. This will almost always not needed to be changed because by far the most common learner to use with AdaBoost is a decision tree – this parameter’s default argument. n_estimators is the number of models to iteratively train. learning_rate is the contribution of each model to the weights and defaults to 1. Reducing the learning rate will mean the weights will be increased or decreased to a small degree, forcing the model train slower (but sometimes resulting in better performance scores). 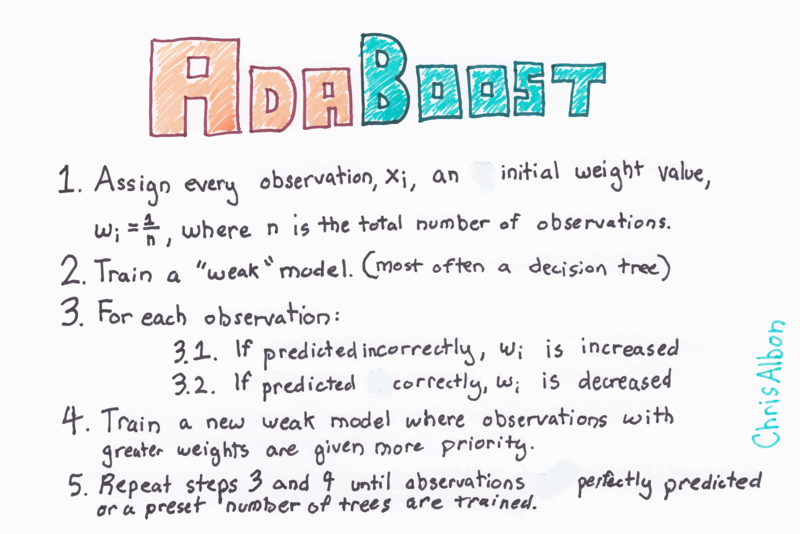 loss is exclusive to AdaBoostRegressor and sets the loss function to use when updating weights. This defaults to a linear loss function however can be changed to square or exponential.